*Drawing Everyday*: Sophie Challenge - Drawing #1! Sophie Challenge - Drawing #1! 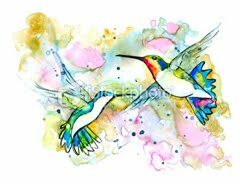 I got our first drawing for Challenge #3 last night from Debbie Simpkins. Deb creates art with a Wacom tablet and her computer. She writes; "I drew this picture of Sophie on my computer, freehand, using a 2B pencil, eraser, and an inkpen to add the white." (The tools she is talking about are "tools in her software program" not physical objects.) She was unhappy with the results, however, I assured her it is an amazing likeness! Thanks so much Deb and congratulations on taking this challenge with me! I'll post my attempt on Sunday. 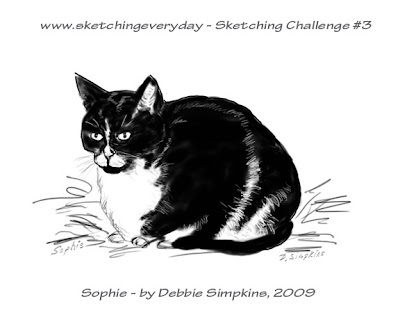 I hope more of you members/followers will give Sophie, this week's challenge subject a try. I think you'll be glad you did. 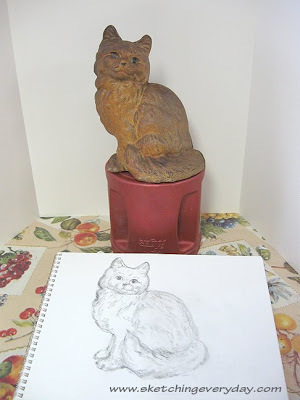 Debbie got me thinking about cats and this cast iron doorstop reproduction caught my eye as a drawing subject today. Here's a photo of my setup. I used a coffee can to bring the cat up to eye level and set up a screen made from foam core (scored lightly at the folds) around the object to isolate it and make it easier to see. Our First Challenger Checks In! No Time To Sketch, You Say? 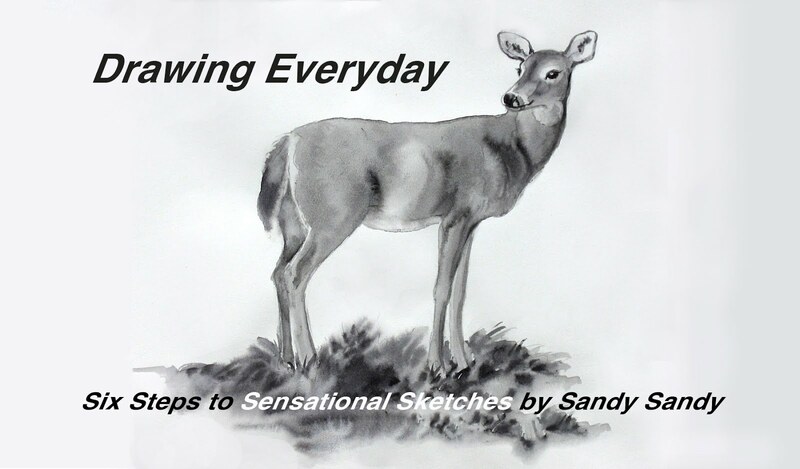 2009 Sketching Demo Now On Line!